The bernette London 7 offers state-of-the-art computer technology for your sewing ideas: a computerized sewing machine with a host of clever extras for high-precision creative sewing. The bernette London 7’s built-in needle threader lets you thread the machine’s needle quickly and easily. Cumbersome needle threading is now a thing of the past – the threader simply grips the thread and pulls it through the eye of the needle all by itself. 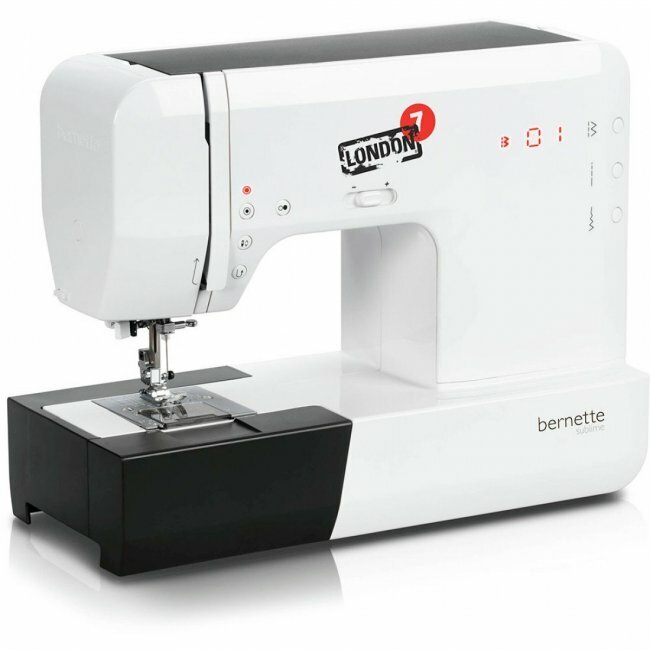 The bernette London 7 is ready to go in a flash, letting you get started with your creative sewing projects instantly. One of the attractive features of the bernette London 7 is its two-level presser foot lift, which ensures plenty of space under the presser foot. This is particularly important when sewing thick fabrics, or several layers of fabric, as the presser foot lift offers you considerably more room to position the fabric comfortably under the presser foot. Because of this and the adjustable presser foot pressure, your bernette London 7 lets you feed and sew a wide range of materials to perfection, regardless of how thin or heavy the fabric is – providing more freedom and space for your creativity. The bernette London 7’s clever flip-top lid protects the bobbin winder, spool holder, and thread-tension dial from dust and ensures their perfect operation at all times. On the inside of the lid you’ll also find a clear chart displaying all of the bernette London 7’s stitches, letting you select the right stitch for your sewing project in no time flat. Flip the lid down for transporting and stowing your bernette London 7, an advantage since it protects the bobbin winder, control dials and spool holder from accidental bumps and knocks, and ensures it doesn’t catch on anything. The bernette London 7’s handwheel for manual operation of the needle up/down position and manual fabric feed is recessed so that it’s flush with the surface of the housing. Nothing protrudes or is in the way, yet the handwheel of the bernette London 7 is easy and comfortable to use. This not only preserves the stylish blo:c design of your bernette London 7, but also ensures practical space-saving storage. What’s more, it ensures that the handwheel is better protected from damage, for example when traveling. The bernette London 7 provides you with a generous total of 60 different stitches that open up a huge range of creative possibilities for sewers. All stitch patterns can be quickly and easily selected via the stitch selector wheel. Choose the appropriate stitch pattern from the inside of the flip-top lid, set it on the selector wheel, and you’re good to go. A red digital display on the white front of the bernette London 7 shows you the stitch you’ve just chosen. Stitch selection is user-friendly and hassle-free – ideal for turning your creative ideas into reality. The bernette London 7 features a host of extras that make sewing even more ergonomic and enjoyable: a bright LED sewing light, a sliding speed control, stitch length and stitch width buttons, the simple snap-on system for changing presser feet, and much more. In addition, six different presser feet which are perfect for accomplishing a host of sewing projects are included with this machine. You’ll be amazed at both the versatility and ease of use of the bernette London 7! For each model of the bernette London series, there are 6 stickers featuring London-related designs that can be simply applied to the machine and removed again, allowing you to give your bernette London a unique look.